Unique romantic getaways and intimate settings in spectacular British Columbia, Canada. The BC Romantic Getaways Catalog is the trip planning guide for lovers & romance. This free catalog offer a variety of vacations and honeymoon & anniversary destinations for lovers. Resorts, elegant hotels, spas, fine dining, dancing, walks on the beach, trails in the woods. Experience the romance of British Columbia! 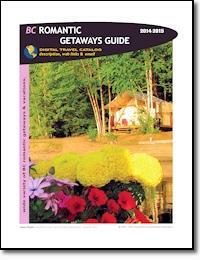 Download the free BC Romantic Getaways Catalog.